I missed this the first time, but i love love that reposed axe hand! It's one of those things that appear so obvious now that I've seen it done and yet I'm sure I've never seen anyone else do it before. 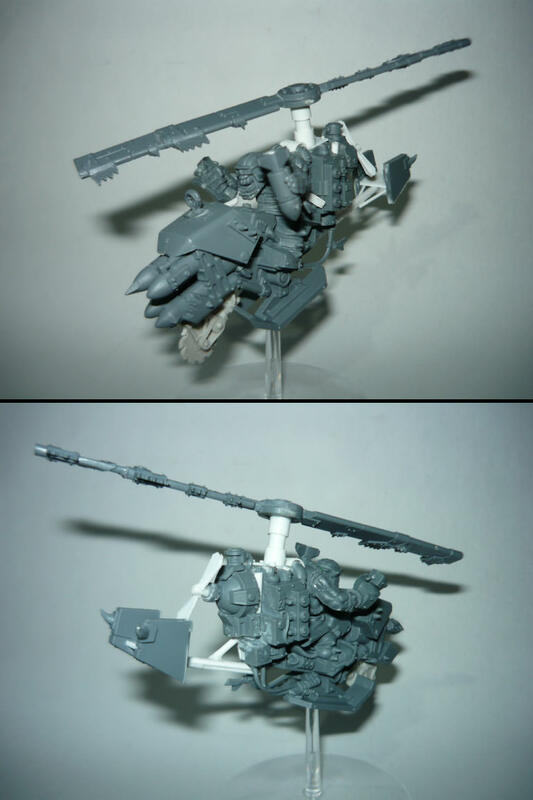 Just have the driver and gunner left. for the record the canopy isn't glued on yet so I can get the driver in. Those Stormboyz looking awesome. Love the conversions and theme behind your army. Keep the updates coming. I do appreciate it. Thanks, yeah the arm is just the stikkbomb arm with a choppa hand stuck on it. I was pretty happy with that one. 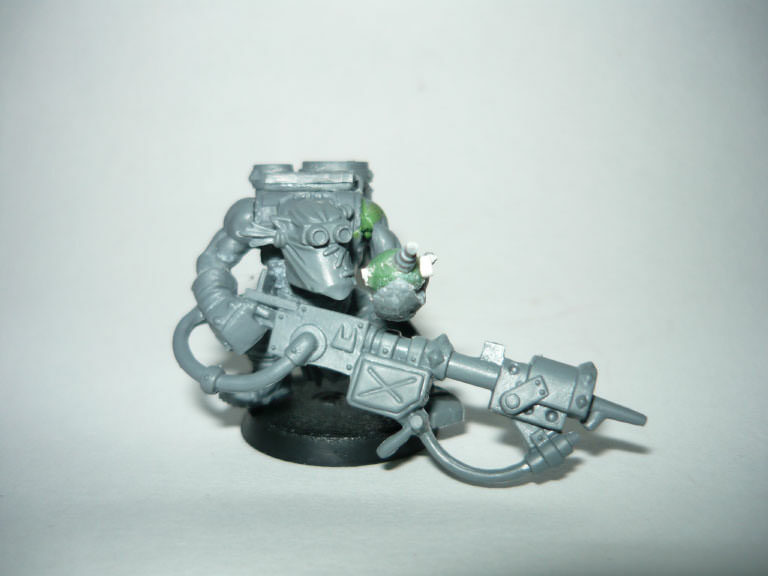 I can't remember what his left arm is, I think it might be form a shoota as it goes across his torso a bit. May I introduce..."Tony Stork: Da Iron Nob"
Really happy with him. getting the smoke trails to line up was a bit of a pain. I feel like it comes across pretty well what he's supposed to be. The first one is just stock standard, the second one has has a bigger fuel pack and the last one is a head/leg swap. I've found it's hard to do too much converting with the burnas, because of the way they are built. 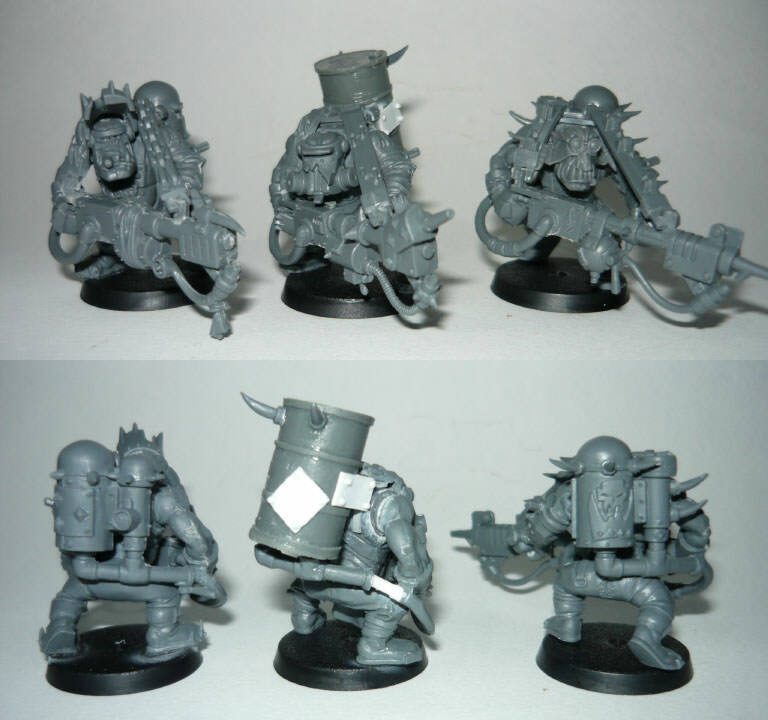 Thanks, I feel they should be pretty varied, seeing as they are made from scrap and whatever the Mek can find. they shouldn't look like they came off a production line. 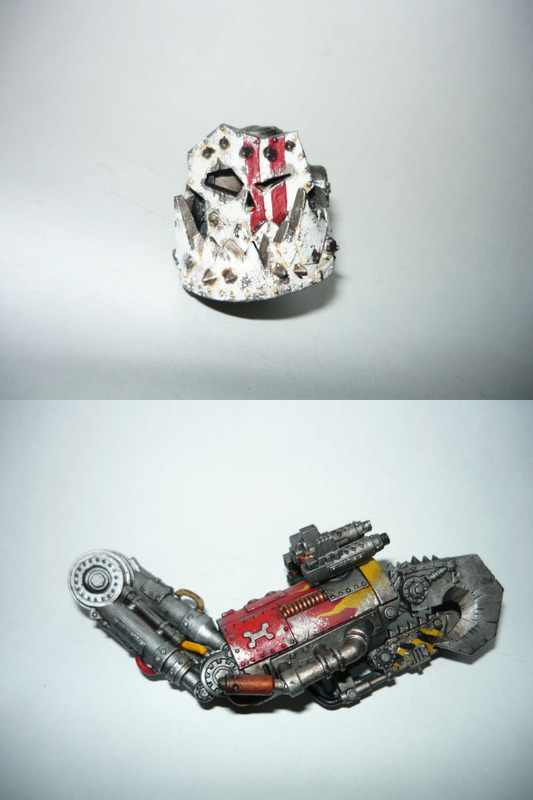 I am loving that Iron Man Ork. It fits perfect with your army. This inspires me to do a Hulk Ork. Keep up the awesome work. These guys were really fun to paint, I'm really happy with the dynamic poses I managed. 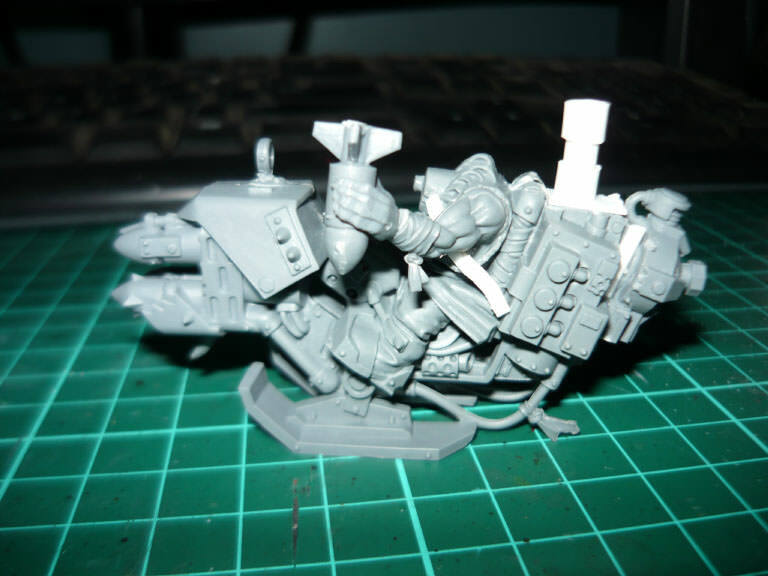 I seriously wasn't feeling that Iron Ork when you posted the WIP. A bit of paint really showed me what I was missing. Excellent work. Is this the whole unit though? 5 doesn't seem like it would get too far in a combat. 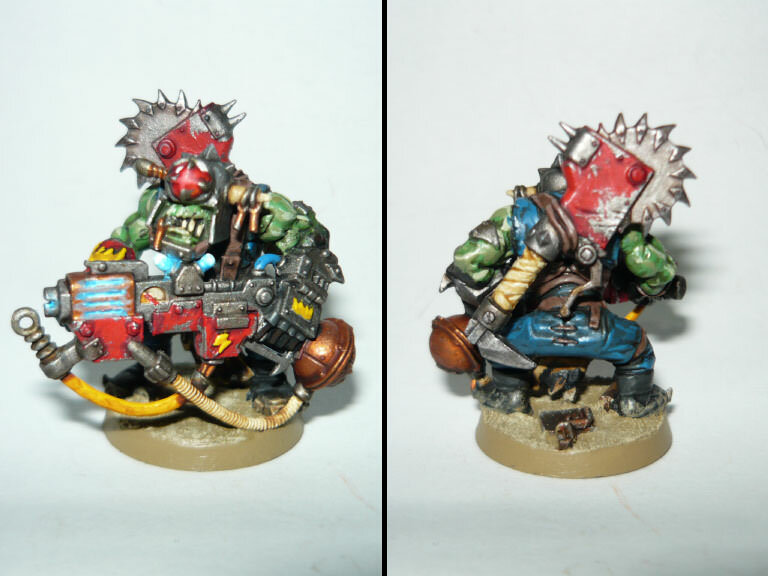 As for Hulk ork, Redwax posted a Snakebite/feral ork Warboss using an AOS Boss whose lower half just screams to have purple trousers on him. I could hardly stop thinking "Hulk" when I saw the unpainted WIP. 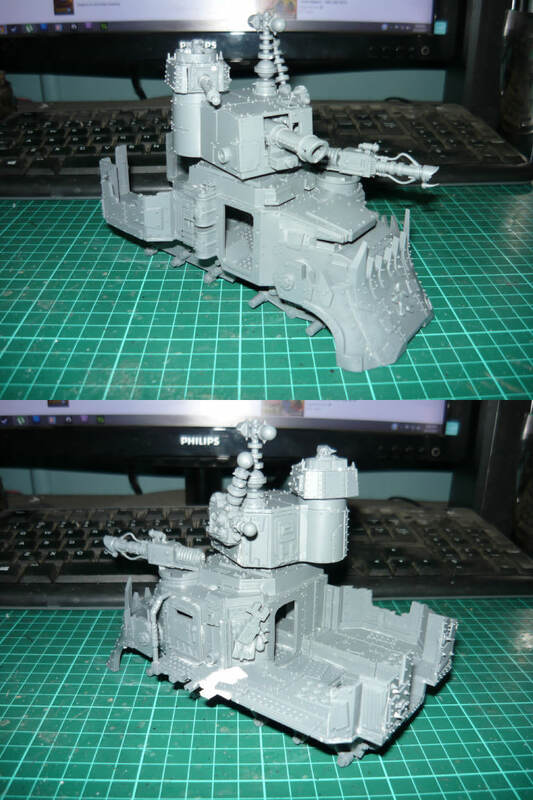 I am actually looking at a GTStuidos Ork Warload for the bases of my new Hulk Ork Idea. Thank you both for the encouragement. 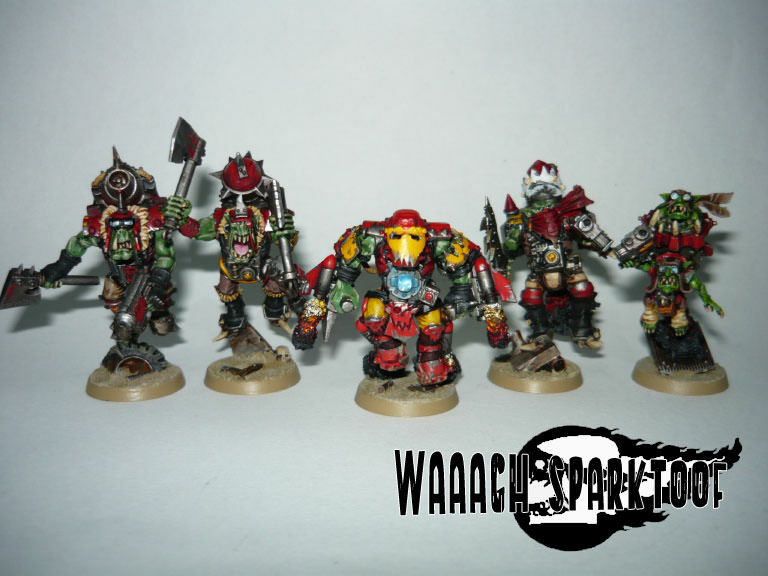 Yet again that unit looks awesome and the Iron Man Ork fits right in too. He's mostly made from Nob, his head is from the burnas kit and the KFF is mostly made deffgun bits. I'm really happy with his pose and level of detail. still need to think of a name for him. Any suggestions? 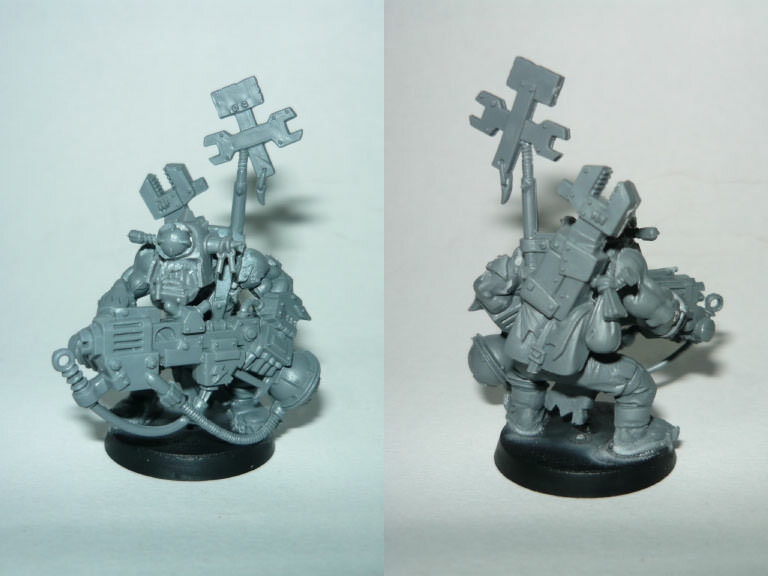 On the subject of meks, I decided to change up my spanner a bit (annoyingly after I'd already started painting) I pulled his backpack off and am gonna replace it with a killsaw I built strapped to his back. Finished the last burna too. 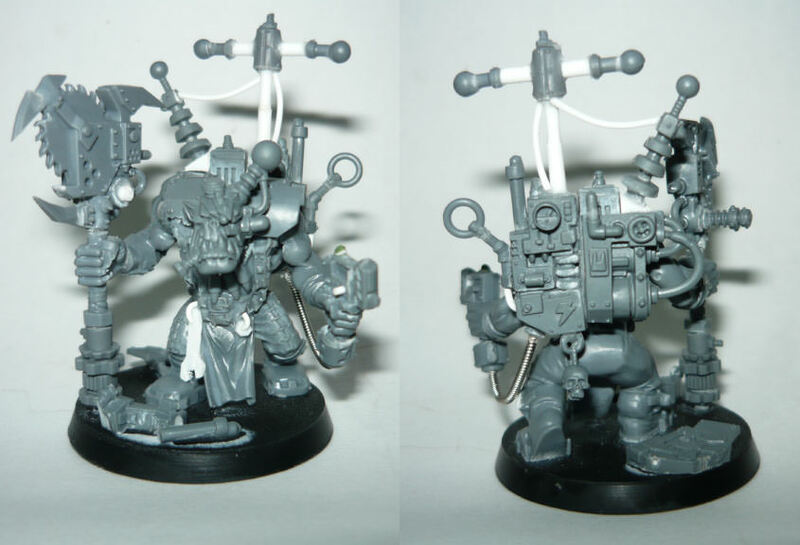 He's holding some piece of weird tech he's found, maybe the Big Mek will appreciate it? Thanks, glad you've come around. I'll probably be adding more to the unit at some point. My army is more aesthetic than competitive, but yeah, they die pretty quick with just 5 of them. Nice job on your KFF! 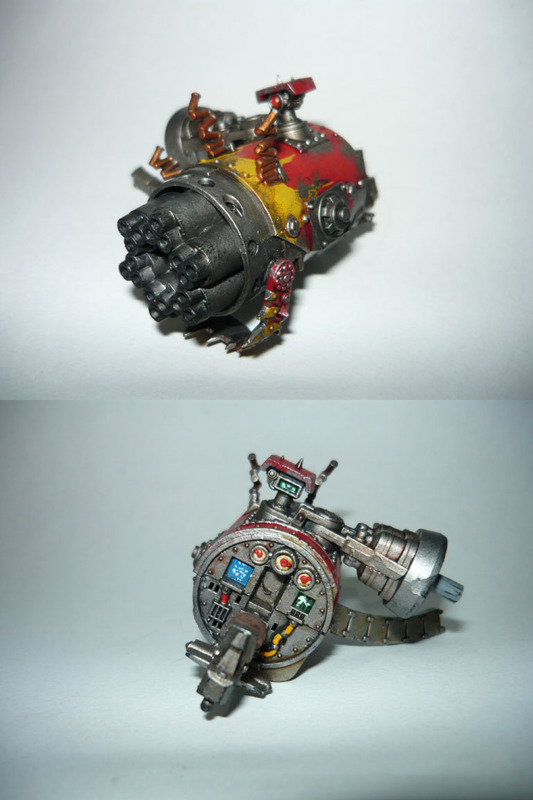 How do you made the smoke trail for your stormboyz? I like his "grinder". Does he have a bionic eye? Yeah, I like to imagine that it was designed to cut scrap off enemy vehicle, but is equally good at cutting heads off enemy bodies. I'm not sure if it's a bionic eye or just part of his helmet, I can't really decide. Since I'm doing Kult of Speed I did my best to make it look like he's running, It kinda comes across but there's only so much movement in the limbs. 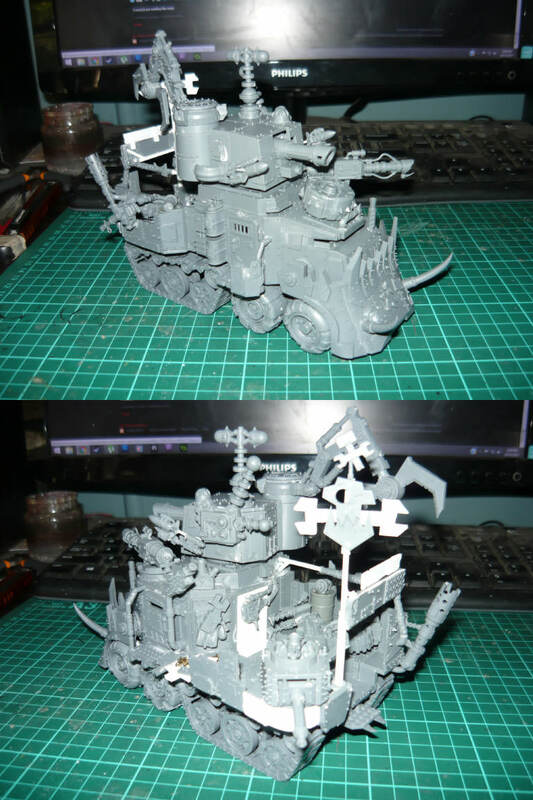 I also added a bunch of banners and boss poles and as many exhausts as I could, because every Ork knows the more exhausts you have, the bigger you're engine!! There are a few other bits hanging on an angle to try and show movement that didn't really show up in the photos. As always, C&C Much appreciated!! 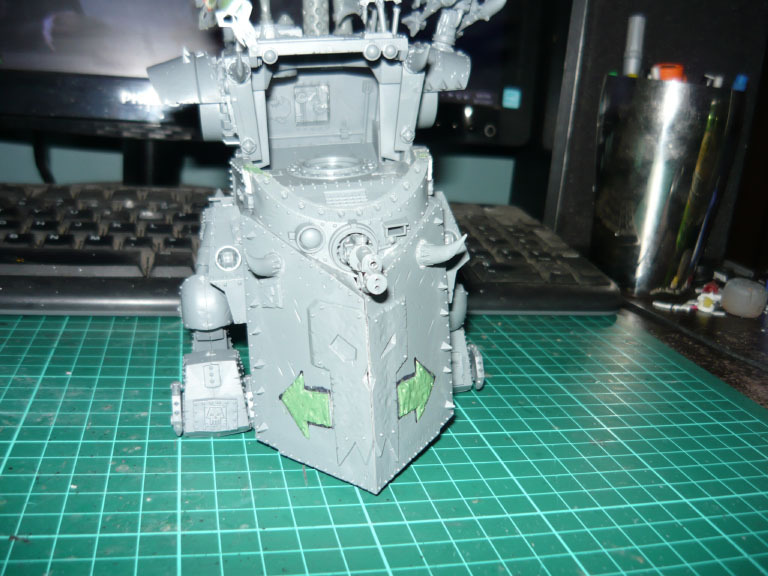 The rolling mek shop's coming along well, it looks a bit cramped but (to me at least) the standard BW kit has never looked big enough for what it's supposed to be, do like the way that you're managing to work around it. As well as being red, the head has racing stripes so this thing is super fast!! Happy with the amount of battle damage on these, hopefully it all comes together nicely! Thanks, I based it on the gyro from Mad Max 2. I know what marmite is but I don't get the reference? 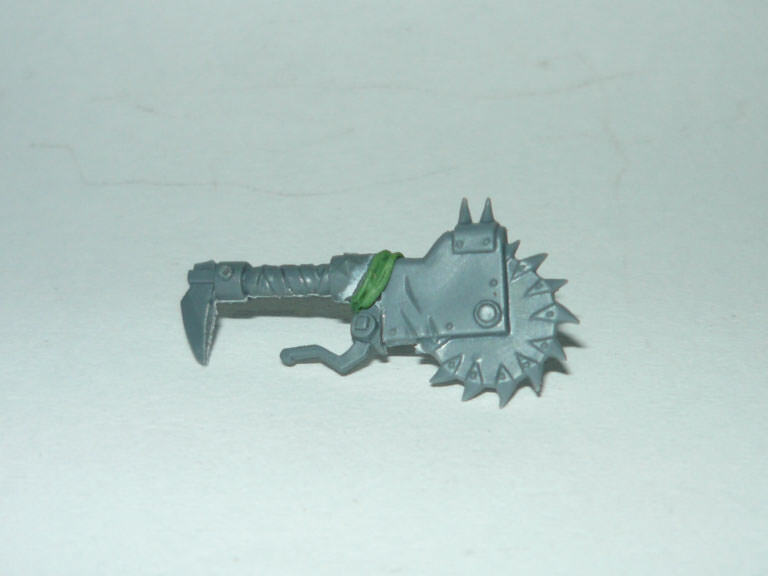 What to do with those spare squig heads from the hopper set?